When my girls are finished splashing around, they dry off while wearing their swim cover ups. 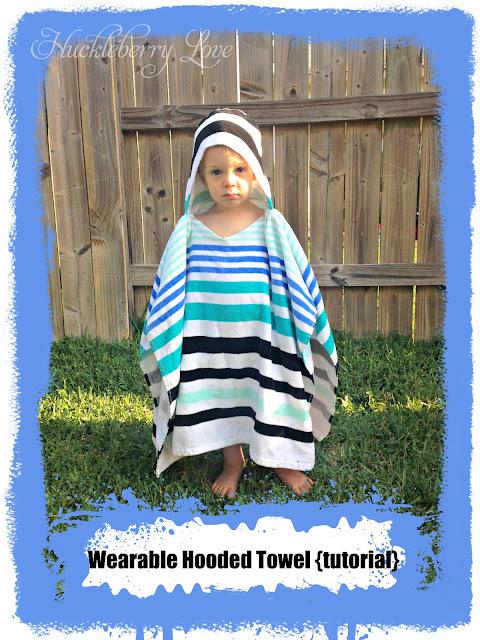 This way they can play, without having to hold a towel around themselves. My little guy dries off in a towel for a split second and sometimes ends up pretty cold in that Texas wind! 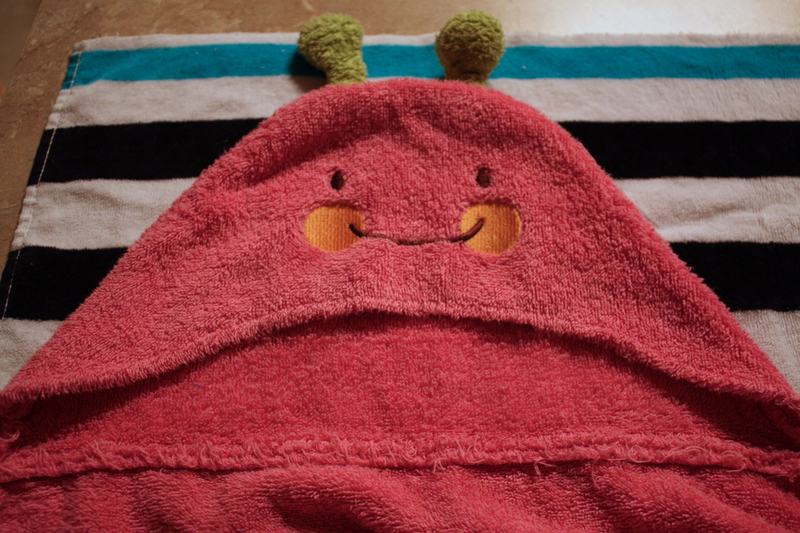 So after looking long and far for some kind of wearable hooded towel, I decided that I would just make one for him. This project was super cheap, easy, and I finished it in a half hour. 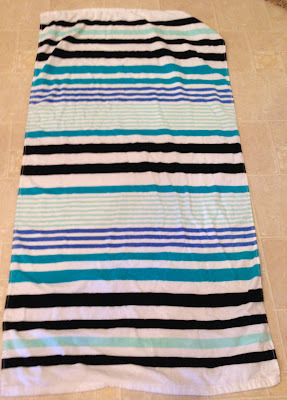 First, I went to my favorite store, Target, to find a towel that fit my guy's style. 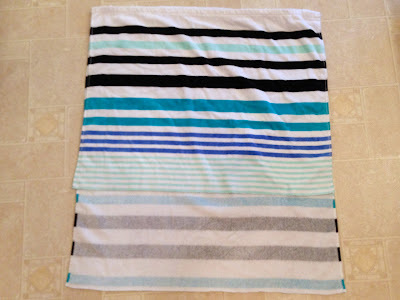 If you're looking to make this project, you'll need a beach towel. Mine was the cheapo Target brand, for only 6.00. You may need two towels depending on the height of the child. 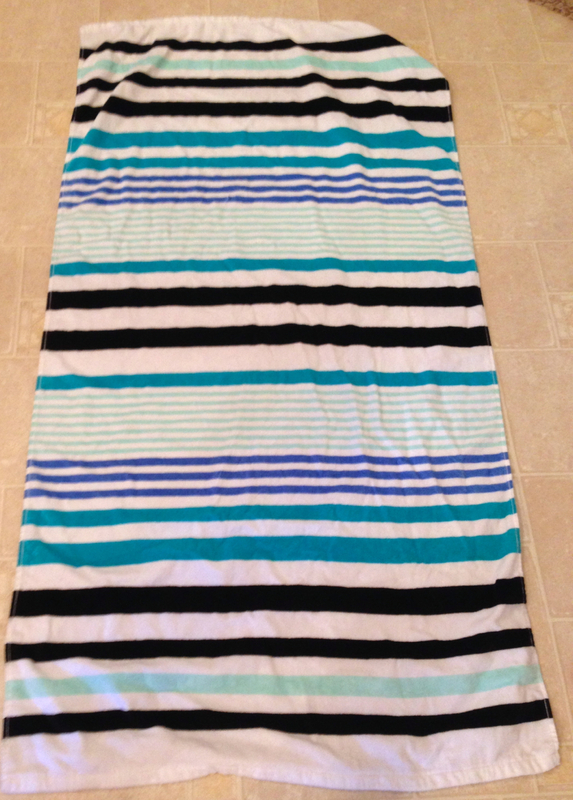 This was made for a 2-3T. 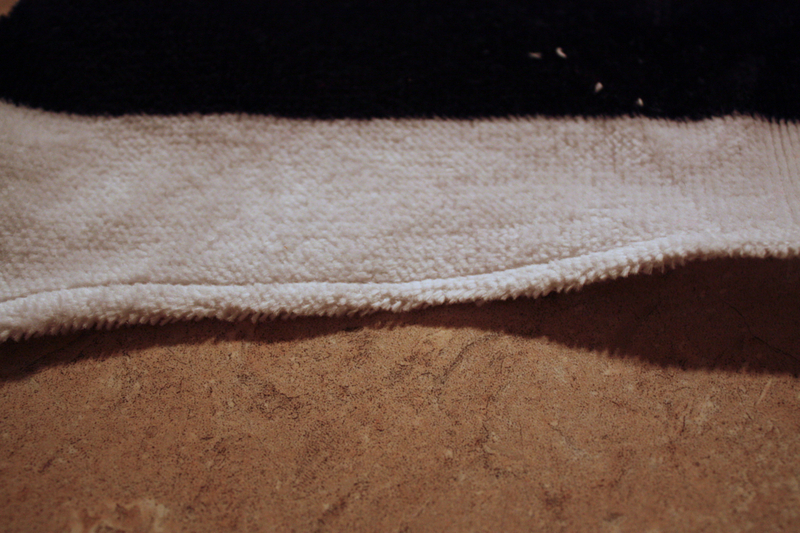 The finished ends are at the top of this picture. This is after the first cut. 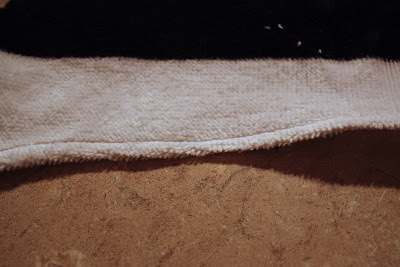 The second cut would be to even up the two lengths of towel, by removing the part of the towel in the bottom of the picture. 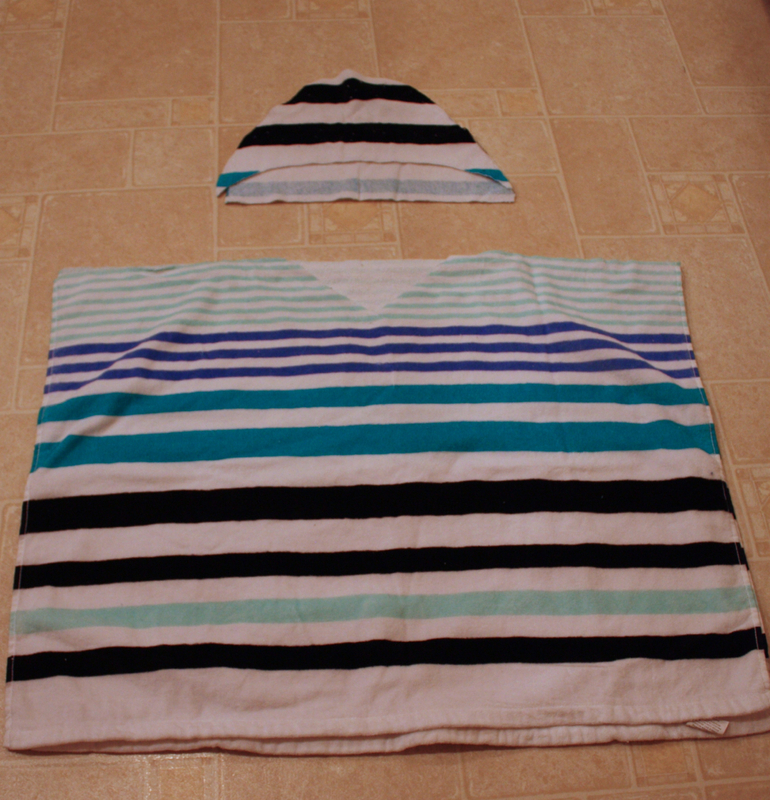 So, I held the towel up to him, from shoulder to ankle, and estimated the length that I would need. 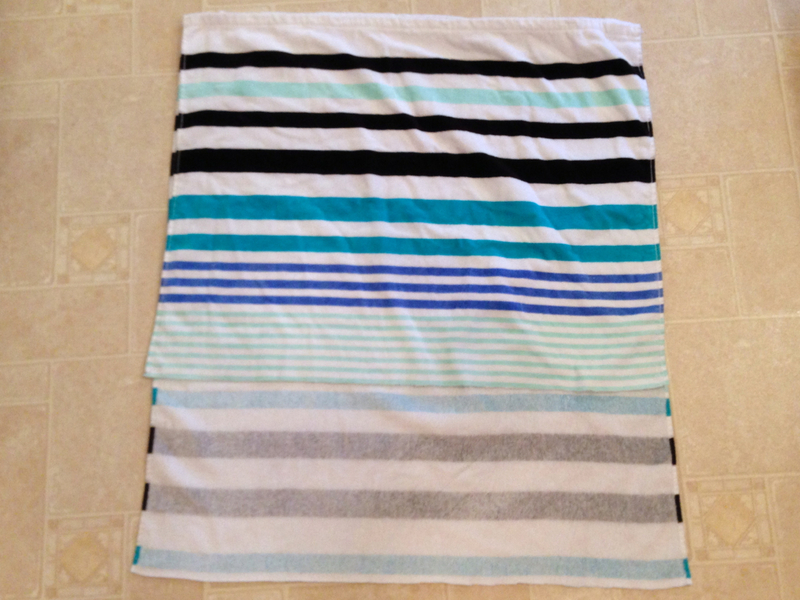 I ended up saving the finished ends and cutting near the middle of the towel. 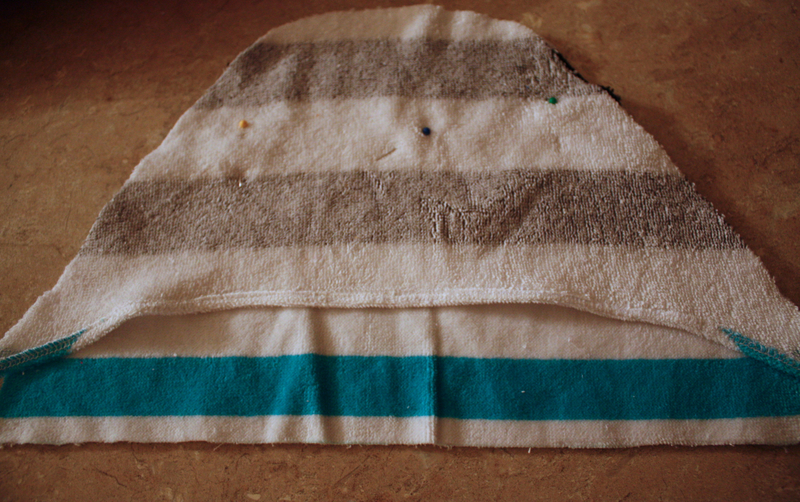 The left over was just enough for a hood. I used my daughter's hooded towel to make a pattern for the hood. 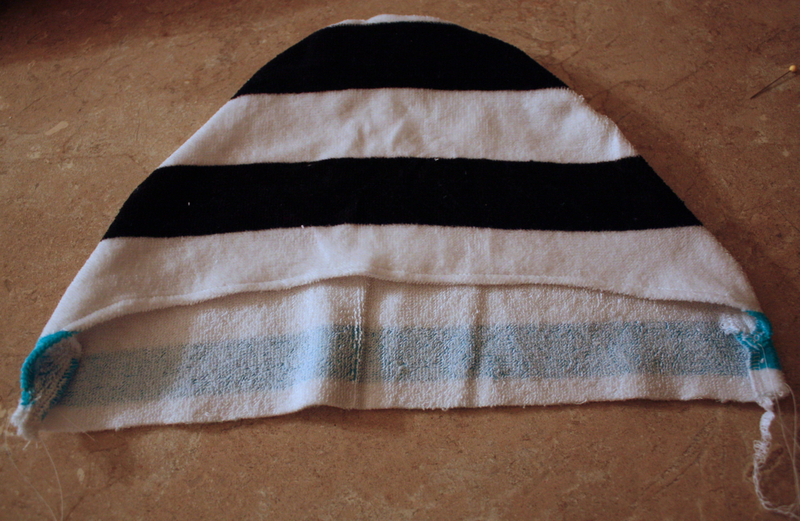 This type of hood stays on better than those with just sides and no front. Serge the front edge of the hood. 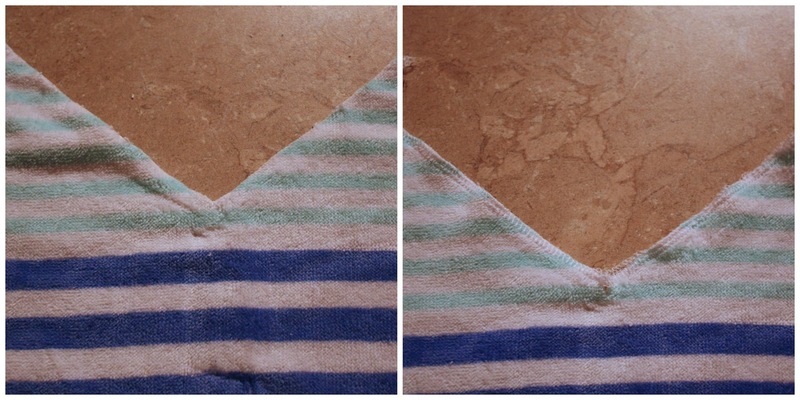 Turn it under and topstitch. 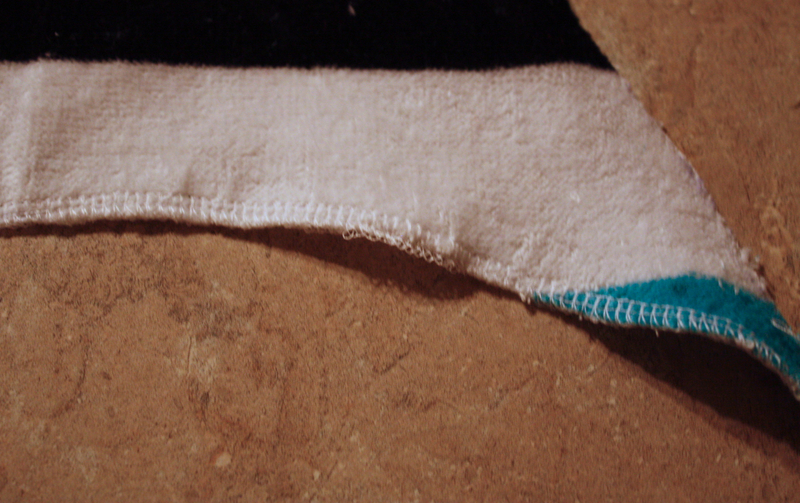 Pin right sides together, lining up top edges and corners. Serge or sew together. Turn right-side-out. 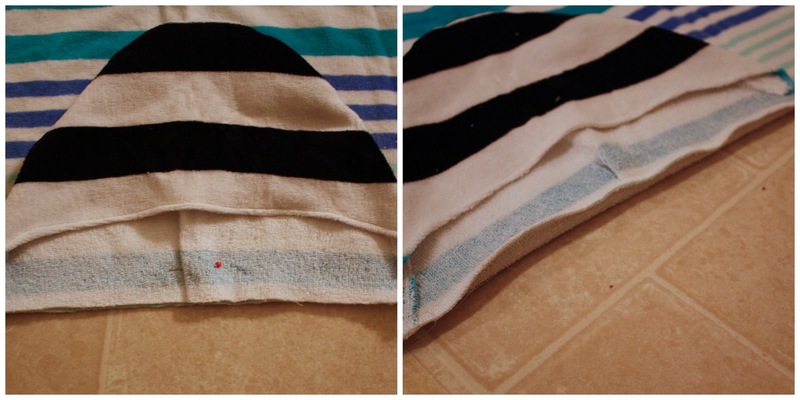 Cut a triangle into the top front of the towel. Finish the edge, fold under, and topstitch. 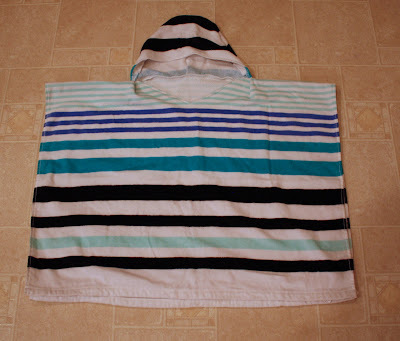 Now you'll have a hood, and towel front and back. Pin hood in the top center of the back part of the towel, along the raw edge. 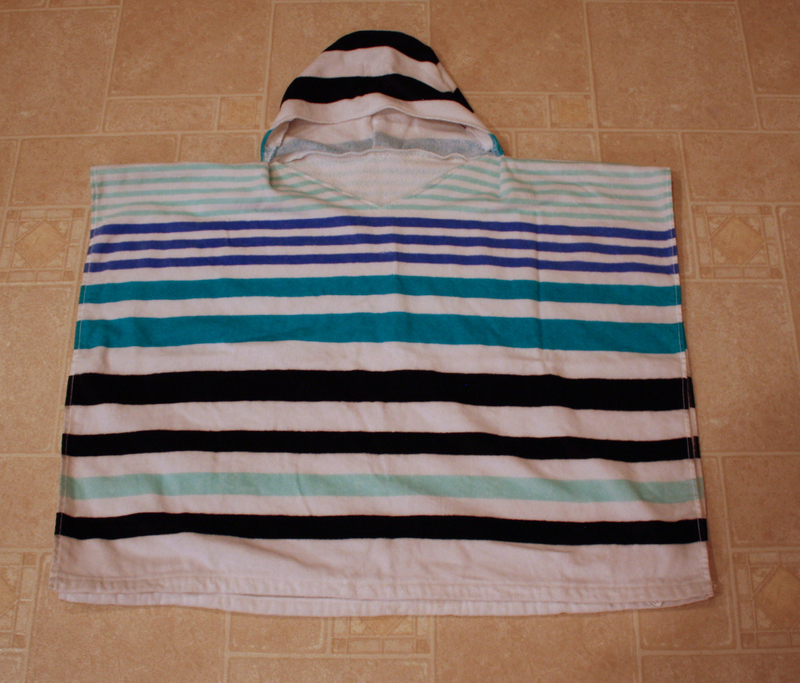 I put a pleat in the middle of the hood so that the opening isn't so big that little shoulders might slip through. Serge/sew together. 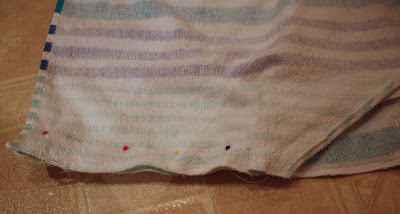 Pin the front and back towel, right sides together, & sew together, skipping over the triangular gap. Now you're finished! I added snaps to the each side of the towel so that it would stay closed if he wanted it to.